Recently I received an email from David and Denise Moore, who serve with Wycliffe in Malaysia, saying that a fellow Wycliffe missionary’s sister and her family had been in a bad accident near Flagstaff. They asked if I could visit them in the hospital and if we as a church could help with any needs. Marla and I went as quickly as we could to the hospital. We found out that the family was on vacation, driving west on I-40 near Ash Fork, when a car in the left lane blew a tire and swerved in front of them, forcing their motor home over an embankment, where it rolled many times. Miraculously, everyone survived, even the wife who was thrown from the vehicle, although she and their son were pretty banged up. The wife also told us about an atheist friend of her husband, whom they had known for a long time. He had seen on other occasions that wherever this family went, they encountered other believers who treated them like family. This atheist couldn’t believe that even though the family didn’t know a soul in Flagstaff, when they had this accident they suddenly had an extended network of people coming to their aid. What this atheist observed is what we see in our text, namely, serving saints. Paul is still introducing his letter to the Romans, most of whom he has never met. He knew that due to his enemies, he was sometimes portrayed as a radical who was teaching all sorts of dangerous things (Rom. 3:8; Acts 17:6; 21:28). But he longed to visit these fellow believers in Rome and share together in the things of God. So he has the delicate task of explaining to these mostly unknown Christians, some of whom may have heard negative things about him, who he is and why he wants to visit them and preach the gospel there. God wants all whom He has saved to be serving saints. I’m taking the theme from Paul’s words in verse 9, “For God, whom I serve in my spirit ….” But it’s obvious that Paul is not the only one in these verses who is serving. He begins by mentioning how he has heard all over about the faith of the Roman believers. He also says that he expects not only to minister to the Romans, but also to be ministered unto by them (1:12). As we saw in verse 7, the believers in Rome were “called as saints.” Thus all believers are to be serving saints. There are four lessons here: (1) Serving saints spread the gospel and rejoice to hear of it being spread (1:8). (2) Serving saints serve God sincerely in the gospel as they wait on Him in prayer (1:9-10). (3) Serving saints long to be with other saints for the purpose of effective ministry (1:11-13). (4) Serving saints are debtors to all people to proclaim the gospel to them (1:14-15). 1. Serving saints spread the gospel and rejoice to hear of it being spread (1:8). “First, I thank my God through Jesus Christ for you all, because your faith is being proclaimed throughout the whole world.” Paul says, “First,” but there isn’t any “second.” He probably just means, “to begin with.” “My God” shows that Paul’s relationship with God was personal. Paul knew God as his God. If you do not know God personally through faith in Jesus Christ, then you are only into religion. True Christianity is not primarily a matter of religion, where you go to church, go through various rituals, and keep certain moral standards. True Christianity is a matter of coming to know the living God personally through His Son as you trust in Him to forgive your sins and give you eternal life (Phil. 3:1-10). Paul thanks God “through Jesus Christ” because Christ mediates all of God’s blessings to us. It is through Christ that we have access to God in prayer. Paul is thankful to God “because your faith is being proclaimed throughout the whole world.” Paul didn’t thank the Romans for their faith, as if it came from them. Rather, he thanked God, because He brought these former pagans in that corrupt city of Rome to saving faith in Jesus Christ (John Calvin, Calvin’s Commentaries [Baker], p. 52). Salvation is God’s gift. Paul heard others all over the Roman Empire talking about the faith of the Roman Christians. This shows that they were a witnessing church. They didn’t have or need a marketing strategy or an advertising campaign. Rather, they had vibrant testimonies of how God had changed their lives through the gospel. As people heard of what God was doing in Rome and talked to others, the word spread, so that Paul heard about them, even though he had yet to visit Rome. And so his heart rejoiced. Faith in Jesus Christ is the essential thing: “Without faith, it is impossible to please Him [God]” (Heb. 11:6). Paul often couples faith with love (Gal. 5:6; Eph. 1:15; 6:23; Col. 1:4; 1 Thess. 1:3; 3:6; 5:8; 1 Tim. 1:5). Love for God and for one another is to be the main fruit of our faith in Jesus Christ. But faith in Him is the foundation, because it is through faith that the Holy Spirit comes to dwell in our hearts and produce His love in us (Gal. 5:22). Bringing it down to a personal level, does your home demonstrate faith in the Lord Jesus Christ and love for God and one another? It is significant that the Roman church was not the result of Paul’s labors, but that didn’t matter to Paul. He rejoiced to hear of God working, no matter who was responsible for it (Phil. 1:15-18). He wasn’t out to build a name or empire for himself. Even so, if we hear that the gospel is spreading, even if we had nothing to do with it, we should rejoice, thank God, and be encouraged that the gospel is taking root elsewhere. Serving saints spread the gospel and rejoice to hear of it being spread. 2. Serving saints serve God sincerely in the gospel as they wait on Him in prayer (1:9-10). The word translated “serve” means, “worshipful service.” It suggests that all of our service should be offered up to the Lord. It should be “for His name’s sake” (1:5). Paul adds that he serves God “in my spirit.” He means that his service comes from the heart or the inner man, which only God sees. This gets down to our motive for serving. Do we serve for the affirmation that we receive from others? Or, do we serve to please God, who knows our hearts? The gospel is such a spiritual “method.” Paul says that he serves God in his spirit “in the preaching of the gospel of His Son.” He states (1:16) that the gospel “is the power of God for salvation to everyone who believes.” The gospel has repeatedly transformed sinners like Paul, a persecutor of the church, into godly saints who exemplify the fruit of the Spirit. And yet today, many of the church growth “experts” say that you can’t preach the old-fashioned gospel about sin, God’s righteous judgment, repentance, and salvation through faith in Christ’s blood. That sort of thing will scare off the people you’re trying to reach. So we need to tone it down and share about how Jesus can build your self-esteem and give you a happy family and personal success. But it is the simple message of the gospel that God uses to save sinners. But why does Paul call God as his witness with regard to his unceasing prayers about coming to Rome? First, some of Paul’s enemies may have told the Roman Christians, “Paul doesn’t really care about you. He doesn’t even know you!” So Paul wants them to know that before God, his prayers for them are sincere and frequent. Also, Paul’s immediate plans, as he will share later (15:25), were to go first to Jerusalem with the gift for the poor saints there. If he is delayed there, again his critics could say, “He talks a good line about wanting to come here, but it’s all just talk!” So Paul wants the Romans to know that they are often in his prayers and that he prays often that God would open a way for him to go there. Paul’s words here reveal several helpful lessons about prayer. First, even Paul had delays and frustrations with regard to the answers to his prayers. He prayed often that he might be able to go to Rome, and even often made plans to go, but thus far his prayers and plans had been frustrated (1:13). Sometimes we think that something must be wrong with our prayer life if we don’t get instant answers. But Paul didn’t get a quick answer and when he finally did get an answer, it wasn’t in the way that he had prayed. A third lesson on prayer is that we must always submit our prayers to the will of God (1:10). There is a mystery here that I often do not understand. The sovereign will of God often includes evil things that are against His revealed moral will, although God is not responsible for the evil. But He uses the evil to accomplish His greater purpose. We should pray against evil, and yet be subject to God’s will in things that we do not understand. In this instance, Paul went to Jerusalem in spite of the Holy Spirit’s warning that he would be arrested. He also rejected the pleas of his friends that he not go there. When he insisted upon going, they said, “The will of the Lord be done!” (See Acts 21:11-14.) Although many would disagree, I think that Paul should have heeded this warning from God. But, he went to Jerusalem, was arrested because of the false accusations of evil men, and spent two years in custody because of the sins of a pagan governor. God worked through all of these things to bring Paul to Rome, thus answering his prayers! So the lesson for us is to pray, but always be subject to God’s will. If He doesn’t answer exactly as we prayed or in the timing that we expected, we must still be in submission to His will, acknowledging that His ways are not our ways. James Boice (Romans [Baker], 1:87-89) suggests three reasons why sometimes our perfectly proper prayers go unanswered. First, “Unanswered prayer may be God’s way of teaching that we are not as necessary to the work we are praying for as we think we are.” Paul wanted to go to Rome to minister to these saints, but they were able to do quite well without him in the meanwhile. While perhaps Paul didn’t need to learn this lesson through God’s delay in answering, often we do. We are not indispensible in God’s program! Second, God may not answer our prayers because “He may have other work for us to do.” Paul’s ministry in Greece, Asia, and even in Caesarea, where he preached the gospel to Felix, Festus, and others, was a part of God’s sovereign plan for Paul. If God has you stalled in a frustrating situation, serve Him there! Third, Dr. Boice says, “There may be spiritual warfare of which you and I are unaware.” The answer to Daniel’s prayers was delayed because of a conflict between a holy angel and an evil demon (Dan. 10:1-14)! Paul explains that our conflict is against unseen spiritual powers, and that prayer is a chief weapon to use in the battle (Eph. 6:10-20). So we often do not know why our prayers are not answered quickly in the way that we envision. But we must trust in and submit to God’s sovereign will. Thus, serving saints spread the gospel and rejoice to hear of it being spread (1:8). They serve God sincerely in the gospel as they wait on Him in prayer (1:9-10). 3. Serving saints long to be with other saints for the purpose of effective ministry (1:11-13). Someone has pointed out that it’s good that Paul was hindered from going to Rome sooner, because we now have the Letter to the Romans due to his delay (Griffith Thomas, St. Paul’s Epistle to the Romans [Eerdmans], p. 53). These verses reveal Paul’s heart for these believers and the aim of his intended visit there. I can only touch on five lessons about effective ministry. First, the atmosphere for effective ministry is warm personal relationships. Paul longed to see these saints. He often expresses his heartfelt desire to be with other believers (1 Thess. 2:8, 11, 17; 3:1, 5, 6, 10). While Paul couldn’t begin to be close with every believer in Rome, his heart of love and concern for them all still comes through. Second, the aim of effective ministry is to see others established in their faith. As Paul wrote to the Thessalonians, who were new in their faith and going through some intense trials, “for now we really live, if you stand firm in the Lord” (1 Thess. 3:8). Third, the sphere of effective ministry is spiritual gifts. Paul wanted to go to Rome to impart some spiritual gift to them (1:11). What does he mean? There are several views, but in 1 Corinthians 12:11, Paul says that the Holy Spirit distributes gifts to each person “just as He wills.” So it’s not likely that Paul had the ability to impart various spiritual gifts to others. Rather, he probably means that he wants to impart the gift of his apostolic understanding of the gospel, which we have in the Book of Romans (Thomas Schreiner, Romans [Baker], p. 54; and Martyn Lloyd Jones, Romans: The Gospel of God [Zondervan], p. 226). As Paul exercised his gift of teaching, imparting especially his understanding of justification by faith alone (Romans 3-5), these believers would be more established in their faith. Fourth, the spirit of effective ministry is mutual encouragement. Paul slightly corrects his comment about imparting some spiritual gift to them by adding (1:12), “that is, that I may be encouraged together with you while among you, each of us by the other’s faith, both yours and mine.” Even though Paul was such a knowledgeable, gifted man, the ministry would not be all one way, from Paul to them. He quickly acknowledges that he looks forward to being encouraged by their faith as well. Have you ever gone to visit someone in the hospital, to cheer them up, but you’ve come away ministered to by their faith? That’s happened to me many times. Fifth, the result of effective ministry is to bear fruit. Paul wanted to obtain some fruit among them, as he had among the rest of the Gentiles (1:13). He is mainly referring to new converts, who would come to faith under his preaching in Rome. But the word fruit can refer to any blessing or benefit that comes through God’s working through us. Our aim should always be to glorify God by bearing much fruit (John 15:8). 4. Serving saints are debtors to all people, to proclaim the gospel to them (1:14-15). The literal rendering of “I am under obligation” is, “I am a debtor.” By “Greeks and barbarians,” Paul means “all nations,” since the Greeks viewed every non-Greek as a barbarian. By “wise and foolish,” Paul means “every level of society, from the most educated to the uneducated.” In other words, every human being needs to hear the gospel, because all have sinned and Jesus is the Savior of every sinner who will repent and believe in Him. Being a debtor has been illustrated as being a person who has been cured of a deadly disease. You can tell others where to find the cure. And in this case, they don’t have to go anywhere or pay any money. The cure is available and free for the taking. When you meet a sinner (that’s everyone! ), you owe it to them to tell them about the cure. And telling them should not be a difficult burden. Paul was eager to preach the gospel to those in Rome, because he knew that it is God’s remedy for sin to everyone who believes. Paul was eager to preach the gospel to the saints in Rome. He was referring not only to evangelism, but also to the application of the gospel to those who have believed. The gospel has much practical application for the saints, as Paul will show in chapters 12-16. Thus, serving saints spread the gospel and rejoice to hear of it being spread. Serving saints serve God sincerely in the gospel as they wait on Him in prayer. Serving saints long to be with other saints for the purpose of effective ministry. And, serving saints are debtors to all people to proclaim the gospel to them. Has God called you as a saint, one set apart to Him? Then He has called you to serve in these ways for His name’s sake. Others were proclaiming the faith of the Roman Christians. What would others proclaim about your Christian life? How do we determine whether our methods in Christian work are acceptable, since not all methods are given in the Bible? How can we know whether to keep praying when our prayers do not seem to be answered? What principles apply? How can the concept of being a debtor to lost people help us to share the gospel more often? In these verses, which are the tail end of a seven-verse sentence, Paul gives us five principles about salvation and service. The main thing to keep in mind is that God didn’t save you so that you could sit around and be happy or have a happy family. Happiness is a means to an end, namely, that the gospel would go out to the nations. That, in turn, is a means to the ultimate end of glorifying God. So if God has saved you, He wants you in some capacity to be part of His means of channeling the gospel to the nations. 1. God saves us by His grace and gives us gifts to be used in His service. Paul writes, “through whom we have received grace and apostleship….” The plural “we” may refer to Paul, along with the other apostles. But the context does not seem to support that meaning, so probably Paul is using “we” in an editorial sense, to mean, “I” (Leon Morris, The Epistle to the Romans [Apollos/Eerdmans], p. 48). Grace is one of Paul’s favorite words. He uses it 100 out of its 155 uses in the New Testament, including 24 times in Romans, the most of any book (Morris, ibid.). Paul received grace, which means, God’s unearned, unmerited favor. If you deserve it, it’s not grace. All you can do with grace is to receive it. The Christian life is not a matter of striving to do enough good deeds to pay for or outweigh your bad deeds, so that God owes you forgiveness. Rather, it’s a matter of coming to God as a guilty sinner, deserving of His wrath, and receiving His undeserved favor through Jesus Christ, who paid the penalty you deserved (see Rom. 4:4-5). So before I go on, may I ask, “Have you received God’s grace through Jesus Christ?” Have you come to Him as a guilty sinner to receive His grace? It’s vital that you start there. You can’t serve God until you have received His grace. God not only gives grace for salvation, but also grace for service. God sovereignly bestows various spiritual gifts on His people by His grace (Rom. 12:3-8). Paul did not volunteer to be an apostle, much less an apostle to the Gentiles. Rather, God appointed him to that task (Acts 22:10; Gal. 1:1; 2:7-9). The word apostle means “sent one,” and it is used in the New Testament to refer to the twelve and to Paul in the narrow sense of those who had seen the risen Lord (Acts 1:21-22; 1 Cor. 9:1), who performed confirming miracles (2 Cor. 12:12), and who laid the foundation for the church (Eph. 2:20). As such, they were given special authority over the churches (2 Cor. 10:8; 13:10). When those men died, there were no successors with apostolic authority. Their authority is passed on to us in the New Testament. The word apostle also is applied to Barnabas (Acts 14:4, 14), James (the Lord’s brother, Gal. 1:19; 2:9), perhaps Silas (1 Thess. 2:6), and to Andronicus and Junias (or, Junia [fem. ]; Rom. 16:7; see also, 2 Cor. 8:23, “messengers”). These workers were sent out by the churches for various ministries. In this limited sense, missionaries today are “sent ones.” But the foundational gift of apostle passed off the scene when the twelve and Paul died. We will look at spiritual gifts more in Romans 12. But for now, let me just say that if God has saved you, He has given you a spiritual gift to use in serving Him. Peter (1 Pet. 4:11) divides them into two broad categories of speaking gifts and serving gifts. While I am not a fan of spiritual gift inventories, I would encourage you to figure out what God has equipped you to do in His service and get involved in serving Him. There are no bench-warmers in the body of Christ! 2. God saves us and gives us gifts to bring about the obedience of faith in others. Paul continues by saying that he has received grace and apostleship “to bring about the obedience of faith among all the Gentiles.” There is debate about how to interpret the phrase, “obedience of faith.” Some say that it refers to the obedience that springs from faith in Christ. Others say that it means that obedience consists in faith. That is, God commands you to believe the gospel, so not to believe is to disobey. I think that Douglas Moo is correct when he says that the two words are mutually interpreting (The Epistle to the Romans [Eerdmans], pp. 52-53): “obedience always involves faith, and faith always involves obedience…. Paul called men and women to a faith that was always inseparable from obedience—for the Savior in whom we believe is nothing less than our Lord—and to an obedience that could never be divorced from faith—for we can obey Jesus as Lord only when we have given ourselves to him in faith.” (See, also, Rom. 10:16, where “heed” means, “obey”; 15:18; and 16:26.) Genuine faith is obedient faith. Genuine obedience stems from faith (14:23). This has two implications for us all, whether we’re gifted as evangelists or not. First, when we present the gospel we must be clear that the call to trust in Christ as Savior is also a call to follow Him as Lord. There is not the option of believing in Christ as your Savior, but having the freedom to continue living in disobedience to His commands (John 3:36). Second, to be a part of calling others to the obedience of faith requires that we live in obedience to Christ. We must practice what we preach. If you are not living in obedience to Christ, please don’t try to share the gospel with others. Your life will send a confusing message to them. For example, I’ve seen young women who profess to know Christ, but they’re sleeping with their boyfriends. Yet they’re also trying to tell them about Jesus, hoping that they will get saved so that they can have a Christian marriage. It doesn’t work! It sends a mixed message! If the young woman truly knows Christ, she needs to repent of her sin and break off the relationship with her unsaved boyfriend. Our witness for Christ must flow out of a life of obedience to Christ. 3. God saves us and gives us gifts to take the gospel to the nations (Gentiles). When Paul uses the Greek word, ethne (1:5), he probably means Gentiles as opposed to the Jews. This does not mean that he did not preach to the Jews. The Book of Acts shows that his custom was to go first to the Jewish synagogues. When they rejected the gospel, he then preached to the Gentiles (Acts 13:44-48). But it’s significant that this formerly ethnocentric, proud Jewish Pharisee would get saved and then devote his life to preaching to the Gentiles, even though it resulted in great personal persecution. Paul’s focus was all the Gentiles. He could not rest as long as some of the Gentiles had not heard the good news. Bear in mind that the Gentiles to whom Paul preached were raw pagans. In 1 Corinthians 6:9-11, Paul catalogs some of their former sins: “Do not be deceived; neither fornicators, nor idolaters, nor adulterers, nor effeminate, nor homosexuals, nor thieves, nor the covetous, nor drunkards, nor revilers, nor swindlers, will inherit the kingdom of God. Such were some of you; but you were washed, but you were sanctified, but you were justified in the name of the Lord Jesus Christ and in the Spirit of our God.” That is “the power of God for salvation to everyone who believes, to the Jew first and also to the Greek” (Rom. 1:16)! This means that no matter how pagan your neighbor or co-worker or fellow student may be, no matter how degrading his sin, no matter how enslaving his substance abuse is, God is able to save him from his sin and to make him a new creature in Christ. He does it through the gospel. So your task is to use your testimony, your spiritual gifts, and your verbal witness to share the gospel with the pagans around you. And, as the Lord raises up workers go to foreign cultures and to cross cultural barriers, we at home need to support them with prayer, finances, and in other practical ways, so that the gospel goes to every tongue, tribe, people, and nation. 4. God saves us and gives us gifts to bring glory to the name of Jesus Christ. Paul’s aim in bringing about the obedience of the faith among the Gentiles was, “for His name’s sake.” Name stands for the person and all of his attributes. It is because of who Jesus is—the eternal Son of God, who took on human flesh as a descendant of David, according to God’s promises in the Old Testament, who offered Himself on the cross as our substitute, who was raised from the dead and is now exalted on high—that Paul endured beatings, plots against his life, and many other hardships to take the gospel to the Gentiles. Paul’s ultimate goal was to glorify the name of the Savior who gave Himself to redeem rebellious sinners. This principle is so important to keep in mind in your service for Jesus Christ. It’s easy to fall into the trap of serving Christ for personal fulfillment. It makes you feel good to help others. It feeds your pride when others tell you how kind or generous or caring you are. But then someone criticizes you because you didn’t meet his expectations or you neglected to do something in the right way. Or you don’t receive the thanks that you thought you deserved. Your feelings get hurt and your pride is deflated. But, also, your motive for serving gets exposed. You weren’t serving for His name’s sake. You were serving for your name’s sake! 5. God’s saving us and giving us gifts is based on His calling us and setting His love on us. A. GOD CALLS US TO BELONG TO JESUS CHRIST. After mentioning the Gentiles (1:5), Paul continues (1:6), “among whom you also are the called of Jesus Christ.” The genitive (“of”) is probably possessive. Throughout Scripture, God the Father is the one who calls us to salvation (Rom. 8:30; 2 Tim. 1:9). For example, in 1 Corinthians 1:9 Paul writes, “God is faithful, through whom you were called into fellowship with His Son, Jesus Christ our Lord.” Here, He calls us to belong to Jesus Christ. “Called” in the New Testament epistles always refers to God’s effectual call to salvation. Douglas Moo explains (ibid., p. 54), “What is meant is not an ‘invitation,’ but the powerful and irresistible reaching out of God in grace to bring people into his kingdom.” Paul makes this clear in Romans 8:30, “and these whom He predestined, He also called; and these whom He called, He also justified; and these whom He justified, He also glorified.” The entire chain of salvation is God’s doing, so that no one may boast in himself, but rather, only in the Lord (1 Cor. 1:18-31). To be a Christian means that God has intervened in your life, calling you out of darkness and into His kingdom of light, where you now belong to Christ and have fellowship with Him. Paul often refers to our new standing as being “in Christ.” We are totally identified with Him. This implies a fundamental break with the world, where we no longer love the world and live for the same things that the world lives for (1 John 2:15-17). We now are those who have been called to belong to the Lord Jesus Christ. B. GOD CALLS US BECAUSE HE HAS SET HIS LOVE ON US. Paul writes (1:7) “to all who are beloved of God in Rome.” Perhaps you’re thinking, “But doesn’t God love everyone?” Yes, but He has a special love for His chosen bride. I’m commanded to love every Christian woman as my sister in Christ, but I have a special love for just one: my bride and wonderful wife, Marla. Even so, “Christ loved the church and gave Himself up for her” (Eph. 5:25). The foundation for everything that we do for Christ is that He “loved me and gave Himself up for me” (Gal. 2:20). C. GOD CALLS US AS SAINTS. “Saints” never refers to a special level of believers, who tower above the average. Rather, it refers to all believers. In fact, Paul uses this same phrase, “called as saints,” in his opening greeting to the Corinthian church, with all of its problems (1 Cor. 1:2). The word means, “holy ones,” or “set apart ones.” God calls us to be set apart from this evil world unto Himself. Robert Haldane points out that there is an order here (cited by James Boice, Romans [Baker], 1:67), “They were saints because they were called, and they were called because they were beloved of God.” In other words, God didn’t call them and set His love on them because of their good deeds. Rather, He called them and loved them and set them apart to Himself for good deeds. The result of God’s calling them as saints is that they live as saints, set apart for God and His service. If you know Christ as your Savior, you are a saint, set apart unto God by His calling you. D. GOD CALLS US TO LIVE IN A SINFUL WORLD. In the same way, we live in the midst of a flagrantly sinful city, where even the “welcome to Flagstaff” signs proclaim our “inclusive community,” a code phrase that means, “your sinful lifestyle is welcome here!” God calls us to live as saints in this city, holding fast to Jesus’ name, and holding forth the word of life (Phil. 2:16). E. GOD CALLS US TO RECEIVE GRACE AND PEACE FROM HIM AS OUR FATHER AND FROM THE LORD JESUS CHRIST. This phrase is a greeting, but it’s more than a greeting. It stems from the priestly blessing (Num. 6:24-26), “The Lord bless you, and keep you; the Lord make His face shine on you, and be gracious to you; the Lord lift up His countenance on you, and give you peace.” It also combines the usual Greek greeting, Charein, which in sound, although not in meaning, was close to charis, grace, with the Hebrew shalom, peace. The two words sum up the gospel: “Grace is the cause and Peace is the effect” (W. H. Griffith Thomas, St. Paul’s Epistle to the Romans [Eerdmans], p. 49). Being saved by God’s grace, we now have peace with Him through Jesus Christ (Rom. 5:1; Eph. 2:1-14). Our new standing with God as recipients of His grace and peace is the basis on which we take His good news to the evil city where we live and beyond to the nations. God also wants us to carry the light of the gospel out of the church, into the dark world around us (Phil. 2:15-16). He has saved us and given us spiritual gifts so that we will be a part of building His great cathedral, His church, among every tongue, tribe, people, and nation. So whatever you do to serve Christ, do it in view of that greater purpose, for His name’s sake. Why is salvation the necessary foundation for service? Should churches allow unsaved people to serve? Why/why not? Why is saving faith necessarily obedient faith? Some argue that this confuses the gospel. Agree/disagree? Why? How can we guard against serving for some selfish reason, rather than for Christ’s sake? What happens when we don’t? Why is it important to emphasize God’s calling and His special love as the basis for our service? What can happen practically if we forget this? The late, great British preacher, Martyn Lloyd-Jones opened a sermon on Paul’s phrase, “the gospel of God,” by stating his fear that we are often so familiar with certain words, such as “gospel,” or so academic in our approach to them, that we are not thrilled and moved to the depths of our being by the wonder of it all (Romans: the Gospel of God [Zondervan], p. 55). The gospel of God is the theme of Romans and Paul describes it here (1:2-4). I hope that God uses these verses to move us to deeper love for Him. Romans 1:1-7 is one long and difficult to diagram sentence in the Greek text. Paul begins by identifying himself (1:1); then he describes what he calls “the gospel of God” (1:2-4); next he explains how that gospel goes to the nations (Gentiles) through Paul’s apostleship (1:5-6); and, finally (1:7), he greets the saints in Rome. We’ll only be able to cover verses 2-4 in this message. The gospel of God was promised in the Scriptures and it centers in God’s Son. 1. The gospel of God was promised beforehand through God’s prophets in the holy Scriptures (1:2). God promised the gospel in prototype in Genesis 3:15, right after the fall, when He said that the seed of the woman would bruise the head of the serpent. The gospel was implicit in the Old Testament sacrificial system, revealed most thoroughly to Moses but, I believe, even revealed from the outset to Cain and Abel. The wages of our sin is death, but God graciously would accept the blood sacrifice of an acceptable substitute. We see it again in type when God told Abraham to sacrifice his beloved son, Isaac. God intervened, of course, to provide the ram instead of Isaac. But He was showing what He would literally do by sending His own Son as the necessary offering for our sins. As Isaiah 53 makes plain, Jesus is the lamb of God who was wounded for our transgressions. The record of Paul’s missionary journeys in the Book of Acts shows that when he was speaking to the Jews, he reasoned with them from the Scriptures, trying to show that Jesus is the promised Messiah. For example, in Acts 13, after summarizing Old Testament history down to David (13:16-22), he concludes (Acts 13:23), “From the descendants of this man, according to promise, God has brought to Israel a Savior, Jesus.” In Acts 17:2-3, we read with reference to Paul’s visit to Thessalonica, “And according to Paul’s custom, he went to them, and for three Sabbaths reasoned with them from the Scriptures, explaining and giving evidence that the Christ had to suffer and rise again from the dead, and saying, ‘This Jesus whom I am proclaiming to you is the Christ.’” (See, also, Acts 9:22; 28:23). It is important to see that the apostles did not make up the gospel. It comes to us from God’s promises through His prophets as revealed in all of the Old Testament. Paul may have used the word “holy” to describe the Scriptures because some of his critics accused him of promoting licentiousness under the banner of grace (3:8; 6:1). They said that Paul set aside the Law of Moses and therefore opened the door for people to live as they pleased. Paul wants us to know that he viewed the Scriptures as holy because they help us lead holy lives. Also, the Scriptures are holy because they come to us from the holy God through His prophets. Paul had the highest regard for the Scriptures. Paul’s message, the gospel of God, was in line with and in fulfillment of the holy Scriptures. Rather than nullifying the Scriptures, he saw Jesus as fulfilling them (Rom. 3:31; 8:4). Two other thoughts here: First, the word “Scriptures” means, “the writings.” God saw fit to have the prophets write down His revelation for their own and succeeding generations to read. He could have sent angels to every language group in every generation around the world to communicate His truth. Frankly, it would have been a lot easier than sending people who have to struggle to learn those languages and translate the Bible into them. 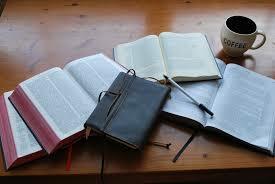 But God chose to reveal Himself through the written Word. Wherever that written Word has gone, cultures have been transformed as people learned to read the Word of God and He opened their minds to its truths. We tend to take it for granted that we have the entire Bible in our mother tongue. But do we devour it and treasure it as God’s holy Word to us? Do we pore over it, seeking to know the Creator through the means He has revealed Himself to us? If you don’t have a plan for reading through God’s Word regularly, I encourage you to begin now. Second, God’s promise in the Old Testament to send the Savior is fulfilled in Jesus Christ. Although from the human perspective, it took many centuries—400 years from the prophet Malachi to the birth of Jesus—God always keeps His promises in His time. No doubt there were scoffers then, as there are now, who mocked, “Where is the promise of the Savior?” But there were those, like the godly Simeon and Anna (Luke 2:25-38), who were waiting expectantly for God to keep His promise. Although you may be tempted to despair at times, wondering, “Where is the promise of His coming?” (2 Pet. 3:4) persevere in faith. God always keeps His promises. Jesus is coming to judge this evil world and to bring full redemption to His people. 2. The gospel of God centers in the person of God’s Son (1:3-4). Jesus is the center of the good news. As I emphasized in our recent series on evangelism, one basic principle when you’re sharing the gospel is to keep bringing the discussion back to the person and work of Jesus Christ. Jesus asked the disciples (Matt. 16:15), “But who do you say that I am?” That is the crucial question! If Jesus is who He claimed to be and who the Scriptures present Him to be, then He is Lord of all and we must bow before Him. In succinct form, Paul shows three things about Jesus: He is God’s eternal Son; He was born of the seed of David according to the flesh; and, He is now resurrected from the dead and exalted to the place of power and glory. A. GOD’S SON EXISTED ETERNALLY BEFORE HE WAS BORN (1:3A). Paul writes (1:3), “concerning His Son, who was born ….” In Romans 8:3, Paul says that God sent “His own Son in the likeness of sinful flesh and as an offering for sin.” So Jesus was God’s Son eternally before He was born of the virgin Mary. He shared the glory of the Father before the world existed (John 17:5). Jesus often spoke of the Father sending Him into this world (I counted 34 times in John; see John 4:34; 5:23, 24, 30, 36, 37 38). So Jesus was not a normal man, who became the Son of God when the Holy Spirit came upon Him. God didn’t adopt Jesus as His Son at His baptism. Rather, He is the eternal Son of God, sent by the Father, who took on human flesh in the incarnation, and who has returned to the right hand of the Father to await the day of His glorious coming. In other words, Jesus is fully God and fully man. Any teaching that denies either Jesus’ full deity or full humanity is heresy. He is God’s unique Son, the eternal second person of the Trinity. So when the New Testament writers refer to Jesus as God’s Son, they are affirming His deity (see John 5:18). Martyn Lloyd-Jones (ibid., pp. 98-99) makes the point that you can have the teachings of Buddhism without the person of Buddha. He is not essential to that religion. The same can be said of all the world’s religions, except Christianity. Christianity is not just the teachings of Jesus. Rather, Christianity is Jesus Christ! You can’t just take His teachings and set Him aside. To be a Christian is to embrace and believe in the person of God’s Son, Jesus Christ. Any view that demotes Him from being God’s eternal Son, the second person of the Trinity, is not biblical Christianity. B. GOD’S SON WAS BORN OF THE SEED OF DAVID ACCORDING TO THE FLESH (1:3B). This phrase links back to verse 2, showing that Jesus is the fulfillment of God’s promises through His prophets in the holy Scriptures. God promised David that one of his descendants would sit on his throne forever (2 Sam. 7:12-13; see Isa. 11:1; Jer. 23:5-6). Israel’s Messiah and Savior would be of the seed of David. But, David’s line on the throne over Israel ceased to exist at the time of the Babylonian captivity, 600 years before Christ. But the New Testament writers clearly affirm that Jesus was born of the lineage of David (Matt. 1:1; 20:30-31; 21:9, 15; Luke 1:27, 32, 69; 2:4; 3:23-31; Acts 2:30; 13:22, 23, 32-34; Rom. 15:12; 2 Tim. 2:8; Rev. 5:5; 22:16). (See my sermon, “The Genealogy of Jesus,” on Luke 3:23-38.) Near the very end of Revelation (22:16), Jesus testifies to John, “I, Jesus, have sent My angel to testify to you these things for the churches. I am the root and the descendant of David, the bright morning star.” Thus Jesus is the Jewish Messiah, the son of David, who fulfills God’s promises to Israel. This means that Jesus is not only fully God; He also is fully human. He shares in our human nature, except for our sinfulness (Gal. 4:4; Heb. 4:15). Thus Jesus could bear the penalty for our sins, since He had no sins of His own. He could be the perfect high priest, who offered Himself for human sins (Heb. 2:14-18). He can sympathize with our weaknesses, which encourages us to come to Him when we are tried and tempted. While I am not aware of any current serious threat to the Christian faith from those who deny Jesus’ full humanity, this was the battlefront of the early church. Even in the New Testament, the apostle John emphasizes this truth (John 1:14; 1 John 1:1; 4:2-3). Jesus was not an angelic or spirit being who seemed to be a man. He was a real man, born physically to Mary, of the lineage of David, according to the flesh. This also means that Jesus is coming again to reign in power and glory from David’s throne. The Jews of Jesus’ day and down through history since then rejected Jesus because He did not conquer Israel’s enemies and set up His earthly kingdom. Instead, Caesar’s government crucified Him. How could a crucified Man be the Savior promised to reign on David’s throne? But Jesus Himself, after His resurrection, told the men from Emmaus (Luke 24:26), “Was it not necessary for the Christ to suffer these things and to enter into His glory?” Then Luke reports (24:27), “Then beginning with Moses and with all the prophets, He explained to them the things concerning Himself in all the Scriptures.” (Paul uses the same line of argument in Acts 13:23-39.) While the Book of Revelation has much in it that is difficult to understand, the main idea is pretty clear: The risen Lord Jesus Christ is coming again in power and glory to judge the earth and to reign in righteousness. You’d better be on His side before He comes! C. GOD’S SON WAS APPOINTED TO BE THE SON OF GOD WITH POWER BY THE RESURRECTION FROM THE DEAD, ACCORDING TO THE SPIRIT OF HOLINESS (1:4A, B). Verse 4 has some difficult interpretive issues, which I’ll try to explain. First, the word “declared” is not translated that way anywhere else in the New Testament. It means, “appointed” or “determined” or “fixed” (Thomas Schreiner, Romans [Baker], p. 42; Douglas Moo, The Epistle to the Romans [Eerdmans], pp. 47-48). This does not mean that Jesus became God’s Son through His resurrection or that He was shown to be at the resurrection what He was all along. Rather, He was elevated to a new level of power as the Son of God by virtue of His resurrection, so that at the name of Jesus, every knee will bow (Phil. 2:9-11; see Schreiner, p. 42, and Moo, pp. 48-49). In other words, in view of the resurrection, Jesus went from being the eternal Son as Messiah (v. 3) to the eternal Son as Messiah and powerful, reigning Lord (v. 4; Moo, ibid.). The other difficult question is what is the meaning of, “according to the Spirit of holiness,” which stands in contrast to “according to the flesh” in verse 3? Some argue that it refers to Jesus’ divine nature, in contrast to His human nature (v. 3). Or, some say that it refers to Jesus’ holy, obedient human spirit as He lived always to do the Father’s will. A third view is that it refers to the Holy Spirit’s role in raising Jesus from the dead. A fourth view is that it refers to the sending of the Holy Spirit after Jesus’ exaltation. Although good men hold to each view for good reasons, the last view in combination with the third is probably the best. Paul is looking at two phases in the ministry of Jesus. According to the flesh, as the descendant of David, Jesus lived in humility with His glory veiled during His earthly ministry. But by virtue of His resurrection from the dead and exaltation on high, Jesus inaugurated the new age of the Holy Spirit (Schreiner, pp. 43-44; Moo, p. 50; F. F. Bruce, Romans [IVP/ Eerdmans], p. 69). Also, implicit in the phrase, “resurrection from the dead,” is that Jesus’ resurrection guarantees our future resurrection (as Paul teaches in 1 Corinthians 15 and Roman 8:11). D. GOD’S SON IS JESUS CHRIST OUR LORD (1:4C). This phrase sums up the first three points. “Jesus” refers to His humanity, that He was born of the lineage of David to the virgin Mary. Jesus was His earthly name, which means “Yahweh saves.” The angel told Joseph before Jesus’ birth (Matt. 1:21), “You shall call His name Jesus, for He will save His people from their sins.” Jesus did not come primarily to help you have a happy, fulfilled life or to reach your full potential. He came to save you from your sins. If you do not know Jesus as your Savior from sin and judgment, then you do not know Him at all. “Christ” means “Messiah,” or “Anointed One,” and also points to Jesus as the descendant of David (Ps. 2:7-12; Ps. 110:1-2). He is uniquely God’s promised Anointed One, who will reign on David’s throne over God’s people. As such, He fulfilled all of God’s promises in the Old Testament. Paul uses “Christ” 379 times out of its 529 New Testament occurrences, including 65 times in Romans. It is because of Paul that “Christ” has become something of a name for our Lord (Leon Morris, The Epistle to the Romans [Apollos/Eerdmans], pp. 37-38). “Lord” in Greek could be used as a polite term, like “sir.” But it also could be used of God. It is the word used to translate the divine name, “Yahweh,” in the Greek Old Testament. So when the early church adopted the confession, “Jesus is Lord,” they clearly meant, “Jesus is the Lord God.” Paul loved to use the complete phrase, “Jesus Christ our Lord.” He uses it 68 times, compared to only 19 in the rest of the New Testament (Morris, p. 48). Matthew 22:41-42 records how Jesus asked His enemies whose son the Christ (Messiah) would be. They correctly answered, “The son of David.” Then Jesus said (22:43-45), “Then how does David in the Spirit call Him ‘Lord,’ saying, ‘The Lord said to my Lord, “Sit at My right hand, until I put Your enemies beneath Your feet”’? If David then calls Him ‘Lord,’ how is He his son?” Jesus was showing them that their view of Messiah was inadequate. They merely thought of Him as David’s son, but in Psalm 110, David calls Him “Lord,” which means that He is God. It is now plain to see what a man ought to mean when he calls Jesus “Lord,” or when he speaks of the “Lord Jesus” or of the “Lord Jesus Christ.” When I call Jesus “Lord” I ought to mean that He is the absolute and undisputed owner and possessor of my life and that He is the Master whose servant and slave I must be all life long. When I call Jesus “Lord” it ought to mean that I think of Him as the Head of that great family in heaven and earth of which God is the Father and of which I through Him have become a member. When I call Jesus “Lord” it ought to mean that I think of Him as the help of the helpless and the guardian of those who have no other to protect them. When I call Jesus “Lord” it ought to mean that I look on Him as having absolute authority over all my life, all my thoughts, all my actions. When I call Jesus “Lord” it ought to mean that He is the King and Emperor to whom I owe and give my constant homage, allegiance, and loyalty. When I call Jesus “Lord” it ought to mean that for me He is the Divine One whom I must for ever worship and adore. It ultimately doesn’t come down to, “Can Jesus give me a happy life?” Rather, the crucial question is, “Who is Jesus?” Is He the eternal Son, risen from the dead, exalted as Lord? If so, then make sure that He is your Savior and Lord! Why is the crucial question, “Who is Jesus?” rather than, “Will He make me happy?” How does this shape our witnessing? Why is it important to see that the gospel was promised beforehand in the Scriptures? What difference does this make? Some argue that you can accept Jesus as Savior without submitting to Him as Lord. Why is this wrong? What Scriptures would you use to counter this argument? List some of the practical benefits that come from affirming both Jesus’ deity and His humanity. What is the Kingdom of God According to the Bible? Many people have heard the term “Kingdom of God,” but few really understand what it is. Throughout the entire Bible, this was the central message! John the Baptist preached the Kingdom of God, Jesus preached it, and the apostles preached it. The last question that Jesus was asked before He left the earth was, “Lord, will you at this time restore again the kingdom to Israel?” The coming Kingdom of God is the message that God wants to convey to every person on earth. The crucial question is, will you be a part of it? We want everyone to understand, straight from scripture, what the kingdom of God is all about. We’re going to start in the Old Testament. This prophecy in Zechariah refers to the time of the Battle of Armageddon. The nations of the world will come down against Israel to battle in Jerusalem. It’s at that time Jesus Christ will come back, fight for the nation of Israel, and establish His rule on the earth. This passage says that the Lord shall be king over all the earth. That’s the Kingdom of God. In that day there shall be one Lord, and His name one. Let’s look at several other scriptures that also refer to this. In Daniel we see a description of the time when human governments will be put down and the kingdom of God will be established. Another prophecy of when Almighty God will rule this world is in Revelation 11. How Do I Become Part of the Kingdom? So, John preached the kingdom of heaven, the kingdom of God. The kingdom of heaven and the kingdom of God are synonymous. We know it was preached by Daniel, when he said, “…in the days of these kings shall the God of heaven set up a kingdom.” That was the kingdom of God. Most importantly, He sent us to preach it. He commissioned His disciples in Luke 9, where He told them to preach the gospel of the kingdom. What Does It Take to Enter the Kingdom of God? The Bible teaches that there are three steps to the work of Jesus Christ at Calvary; the death, the burial, and the resurrection. If we accept what happened on that cross, this is what we oftentimes call, “accepting Christ.” We refer to it as, “accepting Christ as you personal Savior.” How do I do that? How do I know when I’ve done it biblically? Do I just hope that I do it right, and maybe I’m saved? Every prophecy in the Bible points straight to the setting up of the Kingdom of God. And the capstone of understanding the Bible is to know how to enter the Kingdom of God. The Bible teaches us that the plan of salvation was accomplished by Jesus Christ at Calvary, and we must accept what He did there. We accept the work of Jesus Christ by obeying the gospel. The gospel of the kingdom is the gospel of salvation through Jesus Christ, resulting in entering the Kingdom of God. But how do we obey the gospel? Lets go now to 2 Thessalonians, because it tells us there the consequences of not obeying the gospel. So, the gospel isn’t just “the good news.” The good news is more than that. The good news is the death, burial and resurrection of Jesus Christ. The good news is that we can have eternal life. The gospel not only tells us that we can have eternal life, but how to have eternal life. And that gospel is that we have been redeemed and can be born again through the death, burial and resurrection of Jesus Christ. 0. Israel (the Jewish people and the land) has been replaced by the Christian Church in the purposes of God, or, more precisely, the Church is the historic continuation of Israel to the exclusion of the former. 1. The Jewish people are now no longer a “chosen people.” In fact, they are no different from any other group, such as the English, Spanish, or Africans. 2. Apart from repentance, the new birth, and incorporation into the Church, the Jewish people have no future, no hope, and no calling in the plan of God. The same is true for every other nation and group. 3. Since Pentecost of Acts 2, the term “Israel,” as found in the Bible, now refers to the Church. 4. The promises, covenants and blessings ascribed to Israel in the Bible have been taken away from the Jews and given to the Church, which has superseded them. However, the Jews are subject to the curses found in the Bible, as a result of their rejection of Christ. Rebuttal: This is great, and shows that the Jewish people and Israel fulfilled one of their callings to be “a light to the nations,” so that God’s Word has gone around the world. It does not suggest God’s dealing with Israel was negated because His Name spread around the world. 5. Paul shows that the Church is really the same “olive tree” as was Israel, and the Church is now the tree. Therefore, to distinguish between Israel and the Church is, strictly speaking, false. Indeed, people of Jewish origin need to be grafted back into the Church (Rom 11:17-23). Rebuttal:This claim is the most outrageous because this passage clearly shows that we Gentiles are the “wild olive branches,” who get our life from being grafted into the olive tree. The tree represents the covenants, promises and hopes of Israel (Eph. 2:12), rooted in the Messiah and fed by the sap, which represents the Holy Spirit, giving life to the Jews (the “natural branches”) and Gentile alike. We Gentiles are told to remember that the olive tree holds us up and NOT to be arrogant or boast against the “natural branches” because they can be grafted in again. The olive tree is NOT the Church. We are simply grafted into God’s plan that preceded us for over 2,000 years. 6. All the promises made to Israel in the Old Testament, unless they were historically fulfilled before the coming of Jesus Christ, are now the property of the Christian Church. These promises should not be interpreted literally or carnally, but spiritually and symbolically, so that references to Israel, Jerusalem, Zion and the Temple, when they are prophetic, really refer to the Church (II Cor. 1:20). “For all the promises of God in Him (Jesus) are Yea, and in Him, Amen, unto the glory of God by us.” Therefore, they teach that the New Testament needs to be taught figuratively, not literally. Rebuttal: Later, in this Teaching Letter, we will look at the fact that the New Testament references to Israel clearly pertain to Israel, not the Church. Therefore, no promise to Israel and the Jewish people in the Bible is figurative, nor can they be relegated to the Church alone. The promises and covenants are literal, many of them are everlasting, and we Christians can participate in them as part of our rebirth, not in that we took them over to the exclusion of Israel. The New Testament speaks of the Church’s relationship to Israel and her covenants as being “grafted in” (Rom. 11:17), “brought near” (Eph. 2:13), “Abraham’s offspring (by faith)” (Rom. 4:16), and “partakers” (Rom. 15:27), NOT as usurpers of the covenant and a replacer of physical Israel. We Gentile Christians joined into what God had been doing in Israel, and God did not break His covenant promises with Israel (Rom. 11:29). In the first century AD, the church was well-connected to its Jewish roots, and Jesus did not intend for it to be any other way. After all, Jesus is Jewish and the basis of His teaching is consistent with the Hebrew Scriptures. In Matthew 5:17-18 He states: “Do not think that I have come to abolish the Law or the Prophets; I have not come to abolish them but to fulfil them. I tell you the truth, until heaven and earth disappear, not the smallest letter, not the least stroke of a pen, will by any means disappear from the Law until everything is accomplished.” Before the First Jewish Revolt in AD 66, Christianity was basically a sect of Judaism, as were the Pharisees, Sadducees, and Essenes. 3) the rapid acceptance of Christianity among the Gentiles led to an early conflict between the Church and Synagogue. Paul’s missionary journeys brought the Christian faith to the Gentile world, and as their numbers grew, so did their influence, which ultimately disconnected Christianity from its Jewish roots. Many Gentile Christians interpreted the destruction of the Temple and Jerusalem as a sign that God had abandoned Judaism, and that He had provided the Gentiles freedom to develop their own Christian theology in a setting free from Jerusalem’s influence. Could it be He was showing us that Temple worship was no longer necessary as His Holy Spirit now resides in us (I Cor. 6:19), not in the Holy of Holies? The antagonism of the early Christians towards the Jews was reflected in the writings of the early Church Fathers. For example, Justin Martyr (c. AD 160) in speaking to a Jew said: “The Scriptures are not yours, but ours.” Irenaeus, Bishop of Lyon (c. AD 177) declared: “Jews are disinherited from the grace of God.” Tertullian (AD 160-230), in his treatise, “Against the Jews,” announced that God had rejected the Jews in favor of the Christians. At the beginning of the 4th century, a monumental event occurred for the Church, which placed “the Church Triumphant” over “Vanquished Israel.” In AD 306, Constantine became the first Christian Roman Emperor. At first, he had a rather pluralistic view and accorded Jews the same religious rights as Christians. However, in AD 321, he made Christianity the official religion of the Empire to the exclusion of all other religions. This signaled the end of the persecution of Christians, but the beginning of discrimination and persecution of the Jewish people. * The ancient privileges granted to the Jews were withdrawn. * Rabbinical jurisdiction was abolished or severely curtailed. * Proselytism to Judaism was prohibited and made punishable by death. * Jews were excluded from holding high office or a military career. In AD 321, Constantine decreed all business should cease on “the honored day of the sun.” By substituting Sunday for Saturday as the day for Christian worship, he further advanced the split. This Jewish Shabbat/Christian Sunday controversy also came up at the first real ecumenical Council of Nicea (AD 325), which concluded Sunday to be the Christian day of rest, although it was debated for long after that. Augustine tackled this issue in his “Sermon Against the Jews.” He asserted that even though the Jews deserved the most severe punishment for having put Jesus to death, they have been kept alive by Divine Providence to serve, together with their Scriptures, as witnesses to the truth of Christianity. Their existence was further justified by the service they rendered to the Christian truth, in attesting through their humiliation, the triumph of the Church over the Synagogue. They were to be a “Witness people” – slaves and servants who should be humbled. The monarchs of the Holy Roman Empire thus regarded the Jews as serfs of the chamber (servi camerae), and utilized them as slave librarians to maintain Hebrew writings. They also utilized the services of Jews in another enterprise – usury, or money-lending. The loaning of money was necessary to a growing economy. However, usury was considered to endanger the eternal salvation of the Christian, and was thus forbidden. So, the church endorsed the practice of lending by Jews, for according to their reasoning, their Jewish souls were lost in any case. Much later, the Jewish people were utilized by the Western countries as trade agents in commerce, and thus we see how the Jewish people found their way into the fields of banking and commerce. The result of these anti-Jewish teachings continued onwards throughout Church history, manifesting itself in such events and actions as the Crusades, the accusation of communion host desecration and blood libel by the Jews, the forced wearing of distinguishing marks to ostracize them, the Inquisition, the displacement of whole Jewish communities by exile or separate ghettoes, the destruction of synagogues and Jewish books, physical persecution and execution, the Pogroms. Ultimately, the seeds of destruction grew to epic proportions, culminating in the Holocaust, which occurred in “Christian” Europe. Had the Church understood the clear message of being grafted into the Olive Tree from the beginning, then the sad legacy of anti-Semitic hatred from the Church may have been avoided. The error of Replacement Theology is like a cancer in the Church that has not only caused it to violate God’s Word concerning the Jewish people and Israel, but it made us into instruments of hate, not love in God’s Name. While the New Testament has been used by Gentile anti-Semites, even within the Church, the writers of the New Testament were Jewish, and therefore their arguments, even critical ones, were from the vantage point of being an intra-communal debate, not inter-communal accusation. Even where the criticism is harsh, it is directed towards a particular group or sect of Jews because of their practices, which needed correcting. For example, even though Yeshua spoke harshly to the Pharisees, He nevertheless said of them, “The teachers of the law and the Pharisees sit in Moses’ seat. So you must obey them and do everything they tell you. But do not do what they do, for they do not practice what they preach” (Matt: 23:2-3). He was distressed that they were “missing the mark” in their self-righteousness, which is something all of us need to be careful of doing. 2) Hear God’s Word and record it – the Bible. 4) There are 77 references to Israel in the NT and none of them refer to the Church. Try replacing the words, “the Church,” where Israel is mentioned and the passage is rendered unreadable and silly, e.g., Rom. 10:1, “Brethren, my heart’s desire and prayer to God for Israel is, that they might be saved.” If you put “the Church” where Israel is mentioned, then it is redundant. The Church is the body of saved believers, so how could Paul’s prayer be for the Church to be saved? 5) Psalm 105 has a seven-fold affirmation of God’s promises of Canaan to Abraham. This is an everlasting promise, as was Genesis 12:1-3. 6) Jeremiah 31:35-37 speaks of the everlasting nature of God’s promises to and for Israel, the Jewish people, which is as sure as the sun that shines by day and the moon and stars that glow in the night. 8) The Gospel and Yeshua came “to the Jews first, then the Greek” (Rom. 2:9,10; Matt:10:5-7;15:24). There is a distinction in roles between the two. Galatians 3:28 says: “There is neither Jew nor Greek, there is neither bond nor free, there is neither male nor female; for you are all one in Christ Jesus.” This is speaking of everyone’s standing before God as equals, because we are all sinners saved by God’s grace and the atoning work on the Cross. Nevertheless, our roles here on earth are definitely distinct; e.g., men and women, mothers and fathers, husbands and wives, etc. all have distinct roles to play. Likewise, Jews and Gentiles have distinct roles to play. 1) “On this rock I will build My Church, and the gates of Hell will not overcome it” (Matt. 16:18). The Church is built on the testimony and understanding of Peter, who is Jewish. Ephesians 2:11-14 indicates that Israel and the Jews (we) were chosen, but Gentiles (you) were also included. 2) The Church is related to Israel and partakers of the covenants, promises, and hopes, but we have not been called to usurp them. Our relationship is as “grafted in” (Rom. 11:17); “brought near” (Eph 2:13); “Abraham’s offspring” (by faith) (Rom. 4:16); “heirs” to Abraham’s promise as adopted sons (Gal. 3:29) and “partakers” (Rom 15:27). 4) To the Jewish people, we are called to show God’s love “for the sake of the Patriarchs” (Rom. 11:28), for without them we would not have had God’s Word or our Saviour who was a Jew from Israel. We are to show God’s mercy (Rom. 11:31). We are to give our material gifts to help them (Rom. 15:27). We are to pray for them and for Israel (Ps. 122:6). We are to be watchman on the walls to protect them (Isa. 62:6,7). We are to help with the aliyah (immigration) to Israel and the building up of Zion (Isa. 60:9-11; Jer. 16:14-16; Isa. 49:22-23). 5) According to Romans 11, we are two distinct groups, both grafted into the same tree, which are the covenants and promises given to Israel; grounded in the same root, the Messiah; drinking of the same sap, God’s Holy Spirit. We do not hold up the tree, but the tree us, and we are forbidden from boasting against or being arrogant to God’s covenant people the Jews (Rom. 11:17-18). Had the Church understood this very clear message from the beginning, then the sad legacy of anti-Semitic hatred from the Church may have been avoided. The error of Replacement Theology is like a cancer in the Church that has not only caused it to violate God’s Word concerning the Jewish people and Israel, but it made us into instruments of hate, not love in God’s Name. Yet, it is not too late to change our ways and rightly relate to the Jewish people and Israel today. Through Bridges for Peace you can read, study and learn more, and also give to demonstrate God’s exhortation to us to bless His Covenant People, whom He still loves. Not only do we need to learn and do for ourselves, but we need to teach others so as to counteract the historical error that has been fostered in the Church for nearly 2,000 years. 1) Gerhard Falk, The Jew in Christian Theology, (MacFarland: Jefferson, NC, 1992). 2) Leopold Lucas, The Conflict Between Christianity and Judaism, (Aris & Phillips, Warminster, UK: 1993). 3) The New International Study Bible, (The Zondervan Corporation: Grand Rapids, MI, 1985). 4) The New Scofield Reference Bible, Authorized King James Version, (Oxford University Press: New York, NY, 1967). 5) Keith Parker, Is the Church the “New Israel?, (Prayer for Israel: Golant, UK). 6) James Parkes, The Conflict of the Church and the Synagogue, (Athenaeum, New York, 1974). 7) David Rausch, The Legacy of Hatred, (Moody Press: Chicago, IL, 1984). 8) Marcel Simon, Verus Israel, (Oxford University Press: New York, NY, 1986). 9) Clarence H. Wagner, Jr., Lessons from the Land of the Bible, (Bridges for Peace: Jerusalem, Israel, 1998). 10) Eds. C. Roth and G. Wigoder, Encyclopaedia Judaica, (Keter Publishing House, Ltd.: Jerusalem, Israel, 1972). 11) A. Lukyn Williams, Adversus Judaeos, (Cambridge University Press: Cambridge, 1935).